As we previously discussed, you shouldn’t put a lot of java code in your jsp page. It’s ok to add small bits of scriptlets and declaration but if you can’t avoid it, it is better to refactor the code and make separate classes for them. Make sure to refactor the extra code into separate Java classes and make use of MVC framework to get ahead of all the hassle. In this tutorial I am going to teach you how to call a Java class through a JSP page. What we are going to do is that we are going to have a JSP file and a Java Class. 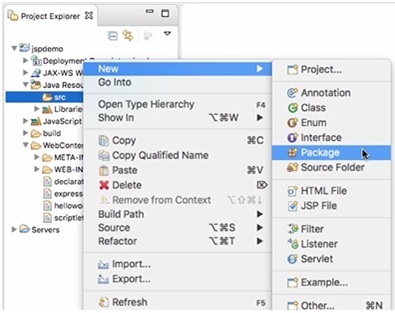 The JSP File will contain all the code related to the front-end and it will call on the Java class, which will contain all the code and will do all the heavy lifting and return the processed result to the JSP File and it is displayed in the browser. Call the created Java class from the JSP File. For the purpose of this tutorial we are going to use the same project we created earlier “jspdemo”. Now open up Eclipse and the project will already be loaded. In the project explorer expand the “Java Resources” and you’ll see a src “source” folder. Right click “src” go to “New” and create a new package. Intended use of the Project – If it commercial then name the first part as “com” or “edu” for educational purposes. Your identity or a small handle – Here I am going to write “evolve” as it is my company’s name, you can name it however you want. Last a specific handle for the package. This should be unique to the class as you might have a lot of classes in your project and keeping track of them could become disastrous. Although very trivial, this method is a great example for demonstrating the purpose of this tutorial. Go ahead save the file. Now go and create a new file in the “WebContent” folder which is going to call this class. Name the file whatever you want and click on finish. Open the newly create file and start writing the code. So that is pretty much it. Save the file run it and see the result for yourself. In the next tutorial I am going to teach you about the JSP Built-in Objects and how to include files in JSP. See you later.